The New York City taxicab had humble beginnings. When the traditional metered, gasoline-powered taxicabs began operating in October 1907, they were in tough competition with other forms of transportation throughout the city. Before the taxicab, New York City transit was dominated by a horse-drawn carriage system. There were disadvantages to the horse drawn carriages, however. They were known to be slow, and they caused congestion throughout the City. Compounding this, horses were dirty, difficult to maintain and sometimes downright dangerous to the public. 1929 NYC Taxi. Image courtesy of NYS Museum By the turn of the 20th century, New Yorkers were looking for an alternative to the archaic horse-drawn carriage. Many new ideas were brought to the floor, as entrepreneurs experimented with bicycle services and both electric- and steam-powered cars. 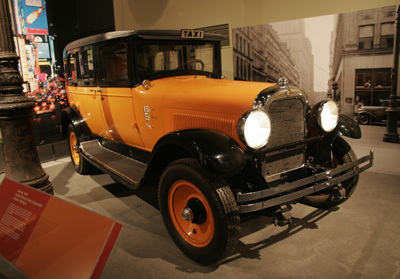 One entrepreneur, Harry N. Allen, was able to successfully secure the significant funding necessary to import a fleet of 65 gasoline-powered taxicabs from France, where they were already extremely popular. Despite the taxicab service’s early success and popularity, the business faced legal disputes and labor unrest, forcing it to fold within a few years. Even with the rapid rise of taxicabs, there were some major problems in the taxicab industry, including a lack of regulation. Because of taxis operated under few regulations, there was little accountability and service was as varied as the number of fleets in operation. The presence of taxis on the road also contributed to a spike in car accidents and car-related fatalities. The very first recorded traffic accident in New York City involved a taxicab. Because of disputes between taxi drivers and fleet operators, strikes were common. In one of the largest strikes of the taxicab industry’s early days, the Taxi Strike of 1934, taxi drivers went from peaceful protesters to angry rioters. They shut down the City and injured dozens of people. In addition, taxicab drivers were not trusted by the public, with some having had brushes with the law before they became taxi drivers. Taxis were considered by some New Yorkers to be a somewhat dangerous mode of transportation, because passengers were never quite sure who was behind the wheel. Taxi drivers were also reputed to have acted as a gateway to the underworld of New York. 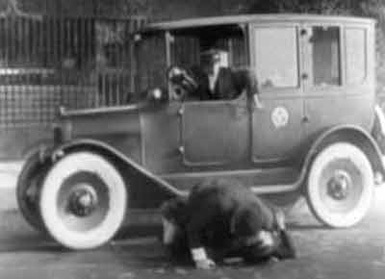 During Prohibition, cab drivers were considered to have been among the most reliable sources of information on where to acquire alcohol and prostitutes. Some cabbies were even pimps, secretly transporting pleasure-seeking New Yorkers to brothels. Even with these problems, taxis were quickly becoming a part of New York life. There were several popular movies were made about taxi drivers during this period, and songs appeared that discussed the allure of a taxi ride. In just 28 years, taxicabs rose from a little known mode of transportation to an influential part of New York life and transportation. Despite their newfound popularity and cultural acceptance, however, taxicabs still had a long way to go before becoming the icons they are today. (l to r) 1928 Model K. Photo courtesy of Coachbuilt.com, 1922 Model H2. Photo courtesy of Coachbuilt.com, 1922 Model H3. Photo courtesy of Coachbuilt.com. We appreciate and acknowledge the works of Dr. Gorman Gilbert and Robert Samuels (The Taxicab: An Urban Transportation Survivor) and Dr. Graham Russell Rao Hodges (Taxi! A Social History of the New York City Cabdriver), from which we gleaned certain facts.